The first week of December, for much of my adult life, brought incredible stress. Not from holiday shopping or social demands; this 10-day period was christened Nutcracker Hell Week. My daughter Danced (the capital D is intentional) and dance companies live and die by revenue from The Nutcracker. Friday, Saturday, and Sunday after Thanksgiving were filled with dress and technical rehearsals. The following week included shortened versions of the ballet for school groups during the day, with performances Thursday evening through Sunday afternoon. Until she got licensed, I had to drive her to all this stuff, often waiting in the wings during director’s notes. By the end of the week, I started twitching if I heard Tchaikovsky’s notes reproduced on the grocery store Muzak. 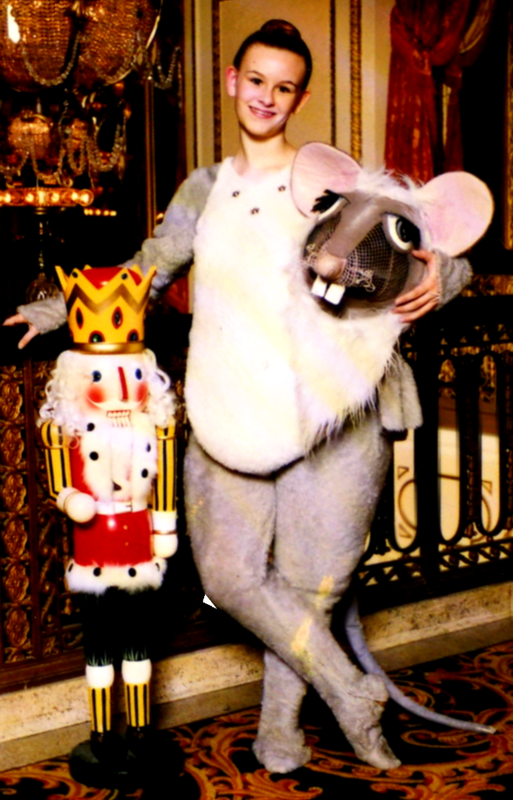 The Nutcracker Syndrome produces a different kind of hell. This disorder produces left kidney pain, beginning in the flank and often moving toward the groin. The problem usually occurs with obviously bloody urine, but can be accompanied by only microscopic blood in the urine, or even no blood. When physicians see these patients, they think it must be a kidney stone, but there is no stone. So what causes such excruciating pain? Two large blood vessels lie on either side of our spines. On the left side of the spine is the aorta, the major artery bringing blood from the heart to the body. On the right side is the vena cava, the vein that returns blood to the heart. The left kidney sits just to the left of the aorta. When blood leaves the kidney, it must get to the vena cava by going across the aorta. 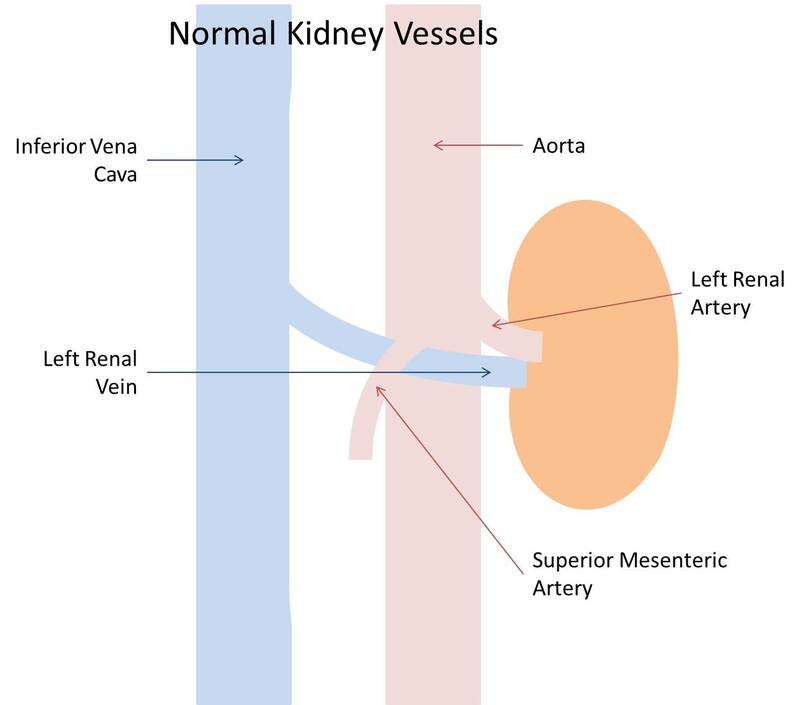 Normal anatomy (figure at right) has the kidney vein crossing in front of the aorta and under a vessel that feeds blood to the gut, the superior mesenteric artery. In some people, the left kidney vein can get compressed between the aorta and this mesenteric artery. Pressure can build up in the kidney (renal) vein, producing pain and bloody urine when tiny vessels in the kidney swell and rupture. In this anatomic situation, the nutcracker syndrome can often be diagnosed by comparing the ratio of the blood flow in and diameter of the renal vein as it crosses under the mesenteric artery to when it leaves the kidney. If the ratio is 4 or more, then the syndrome is highly likely. Magnetic resonance arteriography may be needed to confirm the diagnosis. Other anatomic variations make the syndrome more likely than the normal picture above. Sometimes the renal vein runs behind the aorta. This large muscular artery can intermittently compress the smaller, softer vein against the spine. 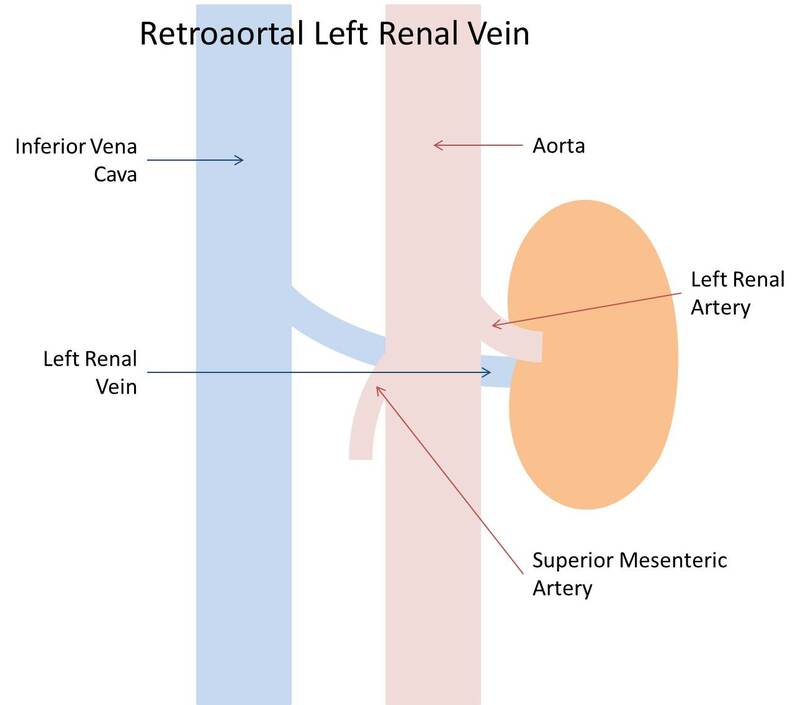 In other cases, the renal vein may be split into two vessels. One may flow in front of the aorta and the other behind. So how do we treat this condition? In adults, a number of invasive interventions have been used successfully. 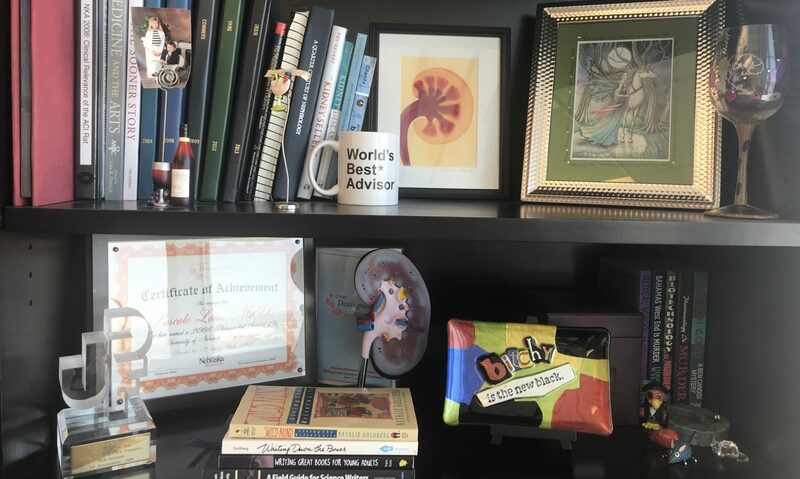 Stenting of the renal vein, surgical bypass of the blocked area, and moving the kidney down to the groin (autotransplantation) have all been used successfully. In children, the condition often resolves spontaneously with growth, particularly an increase in the body mass index as these kids go through puberty. Increases in the perivascular fat pads may increase the angles between these arteries, preventing such severe compression. Surgical correction is generally reserved for severe cases that do not appear to be resolving over a period of months. The Nutcracker can seem like hell, but the nutcracker syndrome can be a literal hell while it lasts. This rare cause of kidney pain and bloody urine must be kept in mind in the differential of kidney stones, especially when the rock cannot be found.